The so-called "mode sorter" is a great optical device that allows for easy separation of Laguerre-Gaussian (LG) modes [Berkhout2010]. 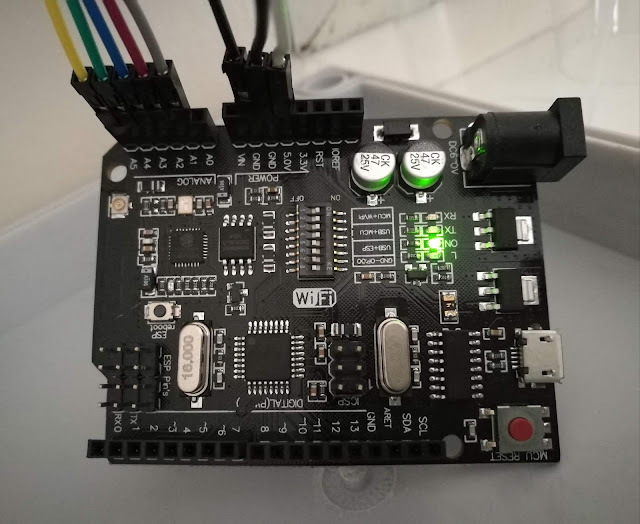 Combined LG modes, which contain Orbital Angular Momentum (OAM) are input to the one end of the mode sorter and on the other end they are output as "spots" which can be detected with a camera, fibre array, etc. This naturally has many uses in optical communications and physics in general. 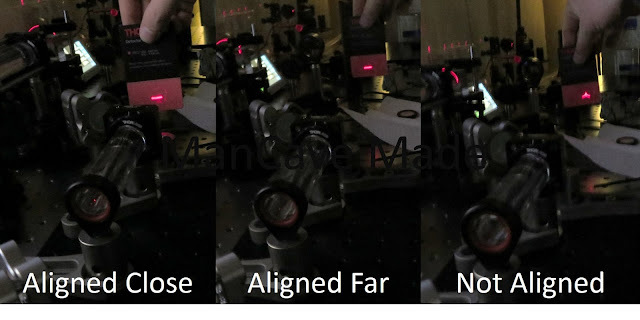 I have been working with one of these devices and since the alignment is very tricky, I felt that it would be useful to document it here for my own reference and hopefully that of others! The first thing to make absolutely sure of is the incoming beams' level. This beam must be perfectly parallel to the axis of the mode sorter, otherwise getting the alignment right after the installation of the mode sorter is close to impossible. I find it useful to mount the mode sorter in a pair of lens mounts. Before installing the sorter, use one of the mounts at the desired height to ensure the beam is level. It's a good idea to place 2 separate mirrors before the mode sorter for dedicated alignment. Place the mode sorter in the path of the beam. Try to line it up with the center of the beam and make sure it isn't tilted. Adjust M1 to make a flat line with the card ~2 cm from the end of the sorter. Now check the beam ~30 cm or more from the sorter. Adjust M2 to make it flat. Repeat this process until the beam is always flat (horizontal). An aligned mode sorter showing the beam close to the end of the sorter (left), far from the sorter (middle) and an unaligned sorter (right). There is a pattern to errors in mode sorter alignment. If the beam looks like the right hand image, above, then the vertical alignment is off. Let's call this a "W" shape. In this case, since the card is far from the sorter, M2 must be adjusted. Any "peaks" in the line are due to vertical errors in my experience. If the line looks like an "S" on it's side then there is horizontal error that will probably result in a W when it's fixed. If there are 2 separate blobs of light, you are way off and should probably start from scratch. When you are finally happy with the beam, you can install a long focal length lens and a camera at the focal point so that you can decompose your beams! At least 500 mm is typically required. The paper referenced above has more detailed calculations as to the focal length of this lens. It is not necessary to place the lens directly after the mode sorter. Anywhere along the horizontal beam is ok - but normally space is at a premium and so mounting is a few cm away is the norm. This entire process will probably take you an hour or more the first time :) Good luck! Thanks Mitch, this is really helpful!